The excitement about the forthcoming launch of the new cup defender had been building for days. The usually quiet little burgh of Bristol took on a holiday atmosphere with bunting and flags decorating its streets and homes. 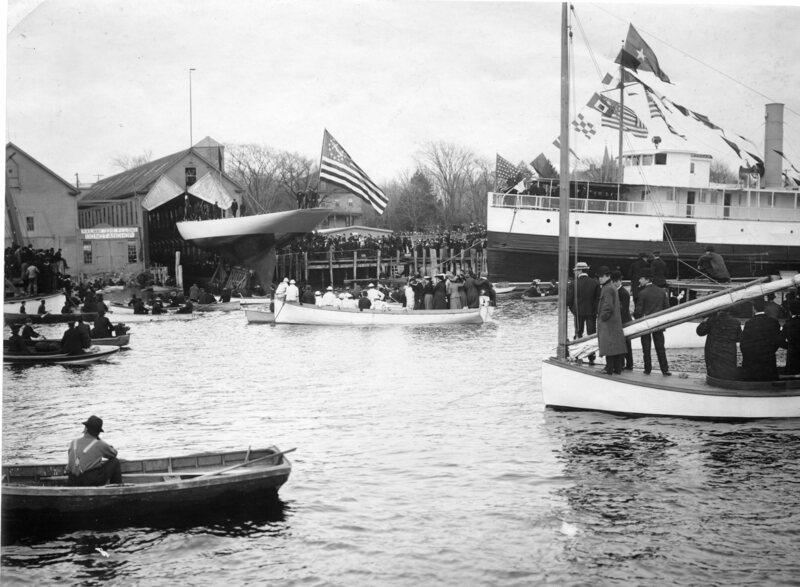 On Saturday, a sunny clear day with moderate winds, thousands arrived by special trains until in the hour before launching, the wharves for half a mile on either side of the Herreshoff south boat shed were literally black with people. In the water more than one hundred small craft, the majority occupied by newsmen or photographers, were grouped on either side of the marine railway. She floated clear some ten minutes later to the cheers of the crowd and the tremendous screeching of whistles from the assembled steam yachts, the crew tender SUNBEAM and the US Navy torpedo boat CUSHING. Thus began the illustrious career of the greatest of the America’s Cup yachts. This entry was posted in Curator's Notes and tagged Herreshoff, RELIANCE on April 11, 2013 by Herreshoff Marine Museum/America's Cup Hall of Fame.